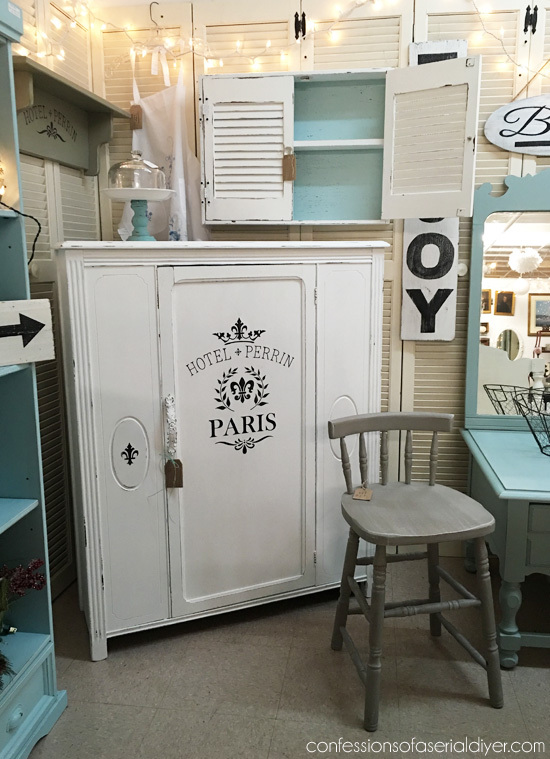 Thinking of renting a booth in a retail space? Have a booth already, but it needs a little something more? You’ve come to the right place! As most of you know, I have a booth in an antique mall where I sell the majority of the items I transform. If you are new here, welcome! 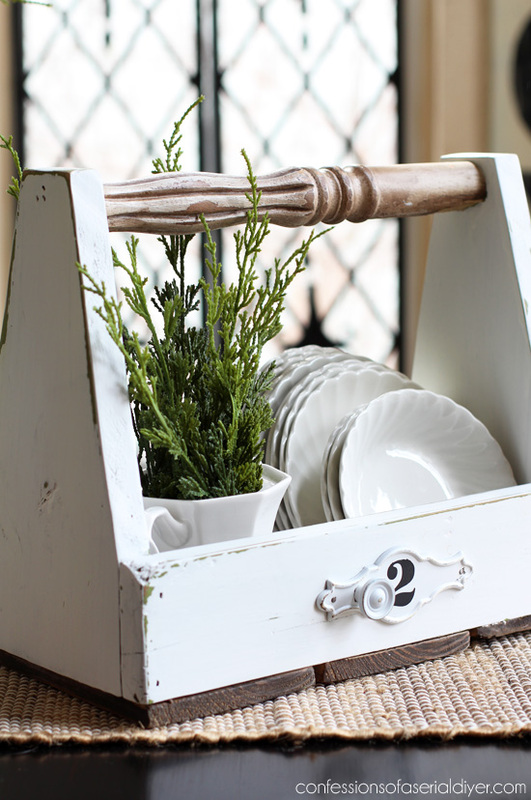 I sell repurposed and vintage items that I have given new life to, usually with paint. 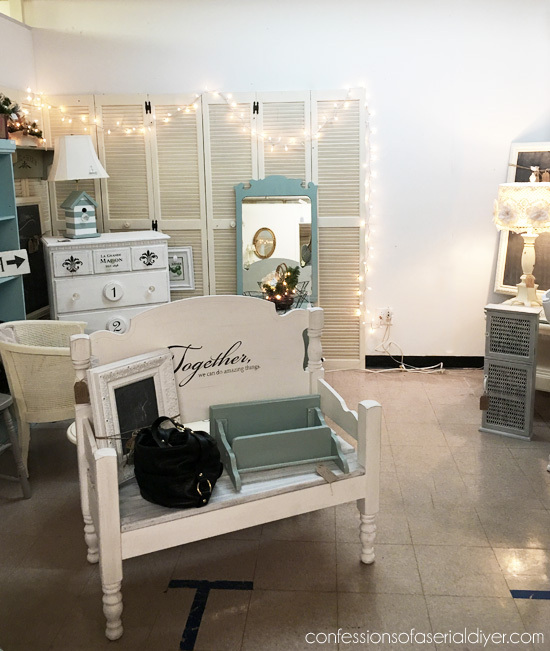 I recently shared updated photos of my booth HERE, and each time I do, I get many questions from readers who want to take the plunge and open a booth of their own, or who are struggling with having success in their own booths. I am lucky that mine has done well, and I thought I would put together a few tips that I feel have helped me, and that others may find helpful as well. Keep your color palette simple. I tend to stick to whites, off whites, soft blues and occasionally grays and it all flows together to give a cohesive feel to my space. These are colors that sell for me, but they are also colors I personally love. It feels uncluttered and easy to shop. And neutrals will just about always sell better for me. They look perfectly at home here in my space. I did craft markets for around fifteen years or so long before blogging, and one big one since I started blogging. If you stick with the same style, you will earn repeat business. Those that love your style, even if they don’t always find something they need, will keep coming back to see what’s new. This tip goes for display pieces, price labels, etc. Everything in your space should be cohesive. Balance the large with the small. Here you can see that I have furniture, but I also have many smaller things to attract buyers to my booth if they aren’t in the market for furniture. “Smalls” as those smaller pieces are called are vitally important to keeping your booth going. 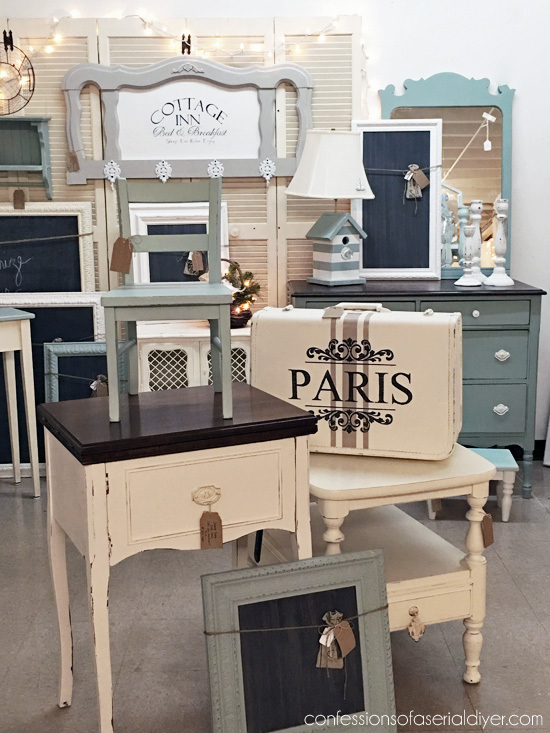 Not everyone can afford a large dresser and although I will make much more money on the time I invested in a dresser, typically it will take much longer to sell. That’s why it’s so important to add the smalls. 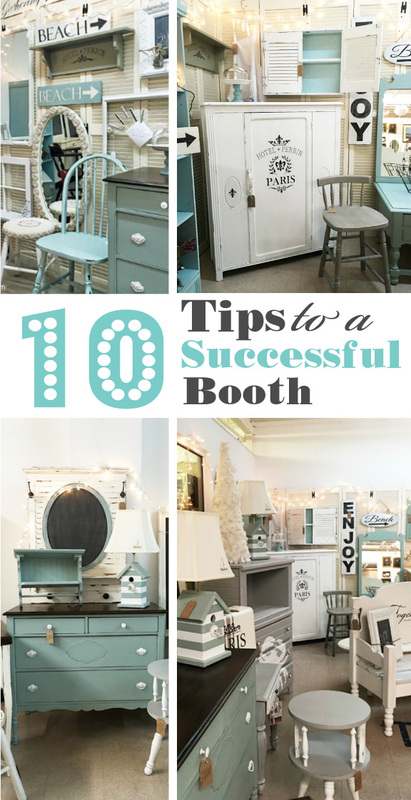 If you paint mostly furniture and are considering renting a booth, you’ll want to keep this in mind. Keep your space clean and uncluttered. I know I mentioned needing the “smalls”, but don’t get carried away with adding a ton of tiny things sitting all over your surfaces. You don’t want to turn off a potential buyer who feels they have to dig a piece out from under a ton of small things to purchase it…too much trouble! If you have a bunch of tiny things, consider adding a shelving unit specifically for those items, or group them in baskets or on trays that are easy to move if need be. Add height to your space. I try to keep a tall piece or two in my booth at all times, just because it makes the booth look better. If everything is all at the same level, it’s boring. I ended up eventually moving a display bookcase there. If you sell smaller things, you too can create your height with your display shelving. Don’t keep everything pushed against the wall. 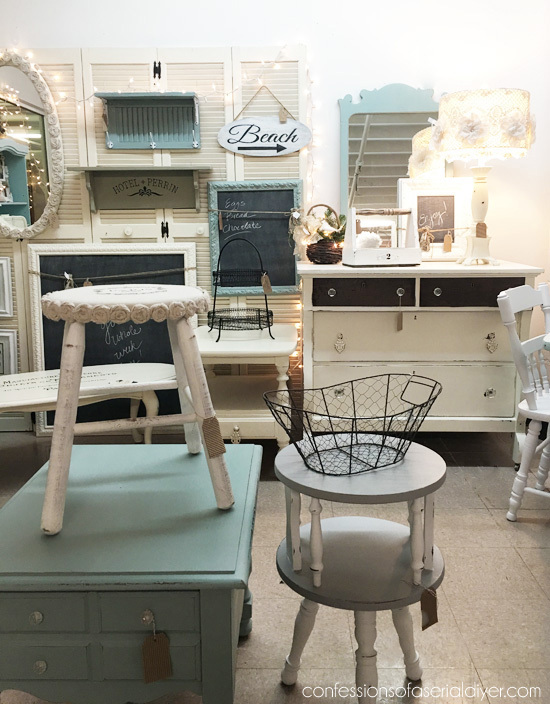 You may have no choice depending on the space you have, but if you have the chance to create an “island” of items in the center of your booth, do it. If people can see everything you have just by walking past, they may just keep walking. Creating the “island” makes shoppers wonder what else is behind there. At least this seems to work for me, both as a vendor and a shopper. When I started, my pieces were flying out of my booth, so I knew I needed to raise my prices a bit. And I did. Some feel that if you price things low, you will sell more and in the end, likely make more money, but will you be able to keep up? The answer is probably not. I see people who are selling side tables for $60. How can you recoup your time, effort, and investment at that price? Your pieces are one-of-a-kind treasures that they won’t be able to find anywhere else. At the same time, I see booths with crazy high prices on their items. You do want your items to sell, right? I mean that is kind of the point. You need to find a balance of getting a good return on your pieces, with offering them at a fair price. This will come with experience. I wish there was a magic formula for pricing, but when you’re saving tired pieces of years gone by, there are so many factors to consider, so there just isn’t. If a particular piece has been sitting too long, consider marking it down. Also visit booths that sell items similar to yours for comparison. Take advantage of the vertical space. I found these shutter doors at a yard sale and spray painted them. Luckily my space backs up against a wall and I was able to screw these directly into the wall. I made “s” hooks from large paperclips by just opening them up, to hang my items right over the slats in the doors. Heavier items are hung on screws. There are many options for vertical displays though so find a way to take advantage of it! Even use the ceiling to hang things from if that’s an option. Move things around. Then move them around again. You are having a lull in sales, but feel like you have the inventory so what gives? Happens all the time, I promise. Move your booth around. I do this all the time. I flip flop things and remove every thing from the shutter backboard and rearrange. 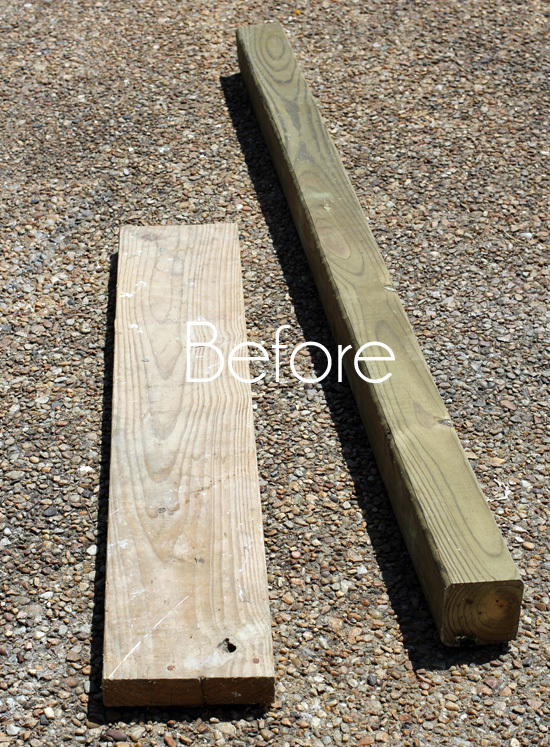 It looks new and fresh, and different things get a chance to shine and be seen. I don’t mean that as harsh as it sounds. I mean if a piece just isn’t selling, rather than taking a loss, don’t be afraid to take it home and give it a do-over. Remember this green caddy that I redid for March Madness? I tend to very easily sell things that also serve a purpose. Trays probably sell the quickest. Chalkboards do well also, as well as any kind of small cabinet. It seems as though if a potential buyer can imagine how items can serve a purpose in their own spaces, they are more likely to buy them. If something typically comes in pairs, sell them in pairs. Another quick tip that I have finally learned with lamps, end tables, night tables, chairs… If they typically come in or are used as a pair, they will typically sell better if you have a pair. I have sat on one too many end tables, chairs, etc where I had only one (and still am), but pairs never last long. This is a great idea that I have yet to employ myself, but thought it was worth mentioning. List your individual items for sale on Craig’s List, with the address listed of where the items can be seen. Facebook groups for selling your items are also a good place to advertise your pieces. 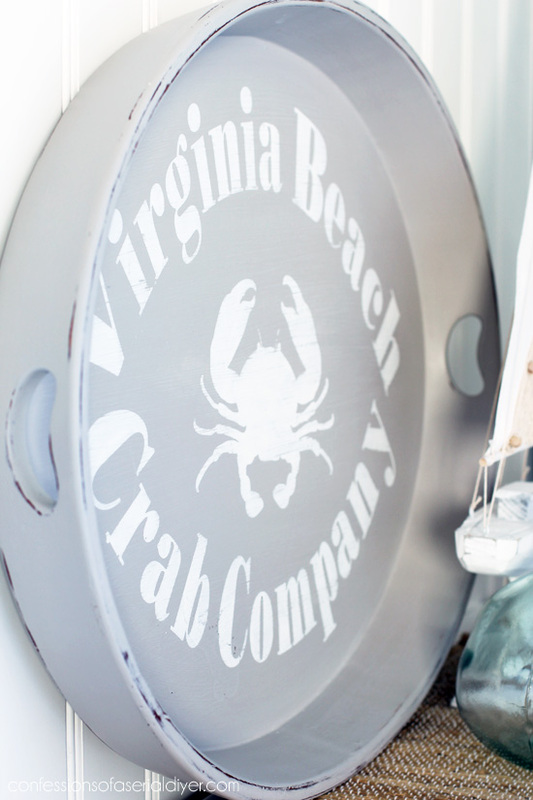 So…still considering renting a booth? If you are going to rent a space, be mindful of what it takes to recoup your investment. Know that making a profit will depend on your commitment to your space. If you will be making things for your space, be prepared for the time and effort it will take to keep it stocked. I did take a break at the Holidays so I could enjoy the season, but I knew my sales would suffer as a result. If you want to be successful, you need to be willing to put forth the effort. Find out the lease terms in the spaces available to you. For my booth, I am on a month to month basis, so I only need to give 30 days notice prior to vacating. If this is the case for you, try it for a couple of months and see how it goes. Some of the girls there are great at filling in the empty spaces and tidying up for me when something sells, but some…not so much. It will be important for you to have a booth that isn’t too far away for that reason. I love having a booth. Seeing all the pretty things come and go is my favorite. Because I blog about most of my transformations, I see it as the booth feeds my blog, and my blog feeds my booth. It’s a win-win for me, but honestly I just love to create and having this space to sell my treasures helps me fulfill that passion. I hope that you have found my experience helpful. If you have anything to add or if there’s anything I missed, feel free to share or ask in the comments below! UPDATE: See what I created with them now HERE! These are great tips. And apply to all areas of the country. I have had my booth for awhile and it is fun to create and have people enjoy the items. Thank you! How very helpful. I have never had booth, but would love to. But I live in a very rural and depressed area of Ohio and nothing is close to me. But I will keep your tips in mind for a time when something does come available. Keep up the good work! Your welcome, Jane! Maybe something will open up around your area. I live in a very well populated area and yet there really are very few places to sell items even around here. Where oh where is your booth? What a lovely place! You really are an inspiration. 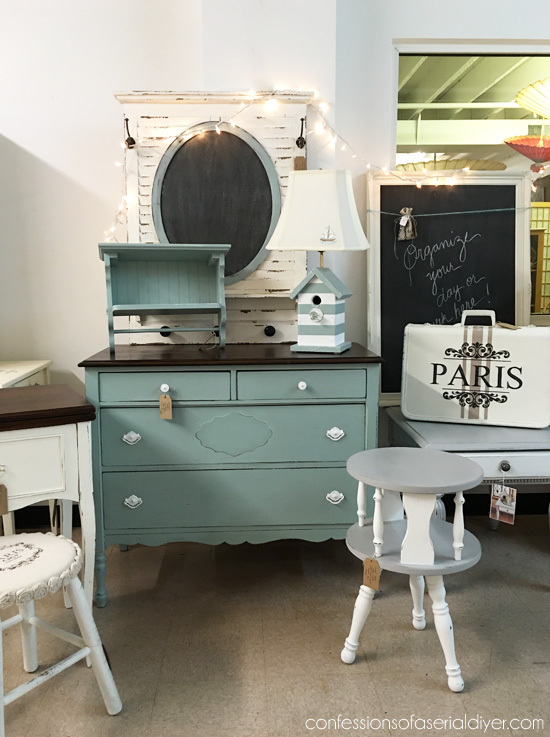 Not only are you a very talented artist of gorgeous re-do items but a savvy business woman. I truly enjoy your blog. Great advice! I think pricing is one of the hardest things. Thanks for sharing some general figures as I’ve been very curious about that. The value of an item is basically what someone is willing to pay and depends on so many factors including the city, store and customer demographics. Time is money! The less Time and effort something needs = better profit. I also agree that Time spent checking on a booth is so important. If someone is considering getting a booth for the first time and there are various options – go closer 🙂 My booth is on the other side of town, off my beaten path and about 30+ minutes drive which doesn’t sound like much but means at least one hour round trip. 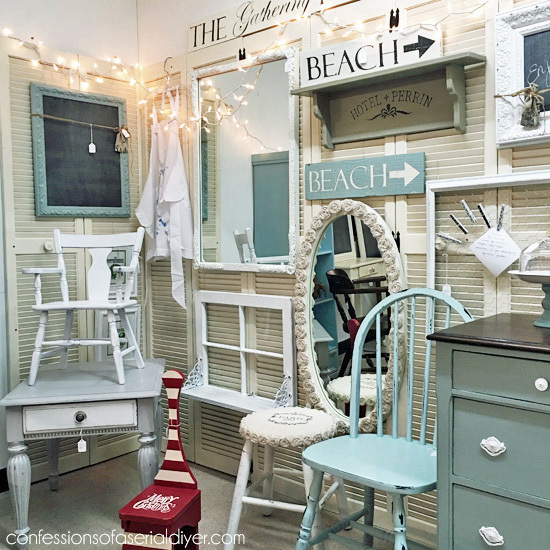 Personally I’ve found that having booth takes more Time – shopping, cleaning/fixing, pricing, organizing and decorating, than I expected, but it allows me to do what I love. My hat is off to you Christy, for All you do And making the time to share it on a blog. You are an Inspiration! Thank you for the info. I’ve had a booth for about 2 years. I love having it but it is very hard to figure out pricing. Thank you for doing your blog posts. I’ve gotten so many ideas from them that I’ve incorporated into my booth. I get so excited every time I go to my booth, anxious to see what has or hasn’t sold. LOL Thanks again. Your booth is beautiful! Great tips, even for successful estate and garage sales. Great tips! I wish I could take advantage of vertical space. My booth is a half-space in a room with a picket fence as my back. My booth partner has the wall which is much better to packing in the merchandise. I’ve always wondered what prices were like in your area. They are significantly lower in mine! I love your booth, it is very calming. I have had one booth almost two years now and enjoy it so much. I recently got another booth which is way smaller. Also I cannot attach anything to the wall since it is a rented building. I have a large bakers rack against the back wall. Any other suggestions for that area? The bakers rack is a display piece only. This really is a win win situation! Booth feeds blog, blog feeds booth and both support shopping!! Love it!!! Though I don’t have a booth, I do shop at several stores. I would be in heaven shopping at your booth! You have given sound advice from my perspective. As someone who frequently shops with my daughter who is in a wheelchair, I find many booths are too crammed full of items. It would be helpful if folks could let their spaces “breathe” as you do. I usually only give a cursory glance to booths that are packed, but I spend my time (and money) where I can easily see what is for sale. Just my thoughts. Thanks again for your lovely blog. I enjoy each and every post! I love everything in your booth. I spied my rosette mirror there. It is just the cutest thing. Thank you very much for sharing you experiences and knowledge. This was one of the best, most helpful booth blogs I have read. Thank you AGAIN!! Some of those things you mentioned I do in my teeny-tiny booth, but I still learned a lot. I just took a webinar from a Kansas City gal (my area of the country) on pricing this morning. Clearly, my pieces are WAY underpriced, but I don’t think I could pull off the prices you listed, at least not where my booth is currently located (I’m not sure why…), but it did help me just to know your idea for pricing. This was really so great! Thank you for sharing your wisdom. What great tips Christy! I appreciate you sharing some ballparks on prices also. That is the most difficult thing for me. I haven’t had much success at selling at booths, but I think my modge podge of colors didn’t help, (rule #1). I totally agree with sticking to a color scheme and style that people get to know you for. Although I knew this, I just had so much old inventory that I wanted to sell. I love how your pieces look together. They could all fit in the same house. I think the only thing I might add is to do research on various malls in your area. Check out what kind of customer traffic they get before you make your decision. And ask about a discount if you lease for 6 months. Some places will give you rent for less if you sign a six month contract. Make sure you have the funds to cover for that time before you take the commitment and are okay with saying good bye to it in case it doesn’t work out. I only saw one tiny peek at Miss Oval. Is she still there?? Yes ha ha boooooo! I’ll be sure to announce when she finally exits the building! Great post, I agree with everything you said. I have two spaces at a local antique mall. I have two so that I can separate my styles and not try and get differing styles all into one booth! White sells best in the mall I’m at. 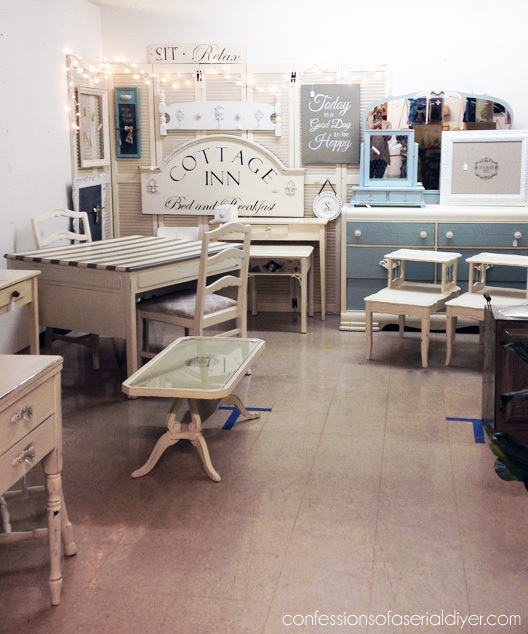 Hi, I don’t have a booth but do paint a lot of large pieces of furniture. Would you be able to share how you move your pieces from your house to booth without damaging them, your vehicle, etc.. Excellent tips, Christy and very timely, as I’ll be doing my first outdoor market this weekend. I think the same tips can be applied tent space at outdoor markets. You’re the third blogger this week that I’ve read about the importance of keeping items unified. Dang, my tent is definitely going to be rather eclectic so finger’s crossed I have success. Definitely trying your “island” tip, thank you! Thanks for the great suggestions. Your booth and items are always beautiful. Loved this post!! Your booth is so serene and love all of your work!! Wondering if you would share about when you sell/resell – what do you do with your income? Like – is there a formula you use for what to do with that income? I.e. put x% back into new pieces to flip, x% into purchasing supplies, x% into your pocket to help with family expenses, and x% into savings etc? I just got into furniture painting a few months ago, so far all of my painted pieces have been for my own home (which was my original intent and purpose, to remake our home affordably) – it is also my plan to begin to sell my work once I get our home mostly done however – *BONUS* in the process of finding project pieces for our own home I have come across some great deals that I could not pass up even though I knew the piece wouldn’t work in my own home plus have changed my mind on a few that I thought would work for us – long story short (sorry!) I have been able to flip quite a few project pieces for a profit (which, while not my original intention, was a nice surprise! ), but am really struggling with how to allot the money wisely [knowing that if it all ends up in our bank account it will be gone in no time (because we are a family of 7 living paycheck to paycheck) and if that happens I will have nothing to put into future projects], but I recognize the need for some of it to be a part of our income, just struggling with what percent? Hi Julie! Thank you so much! I would love to be able to give you some really smart answer about how I allocate the money I bring in, but unfortunately I can’t. I do save a good portion of it since I have to pay taxes on it at the end of the year, but I don’t have a magic formula. I do believe in the power of a savings jar though. I have a jar in my closet that I do add a little to here and there, and there is something to be said for seeing the money add up in there. On Saturday mornings, I would use that money to go yard saling for new treasures to redo. I hope you can find a plan that works for you. I wish you the best of luck on your new adventure! Thanks so much, Christy, for sharing your experience! I appreciate your candor and words of wisdom. Very helpful article! Thanks for your great ideas! I do have an island in my smallish booth and it does seem to draw people in. I need to pare down on the small things–I think they distract from my furniture pieces and make them harder to see. Thanks for including the pricing tips–I charge less than you do. Maybe I need to raise prices! I’ve also learned that furniture with storage sells better than cute little drawerless accent tables. 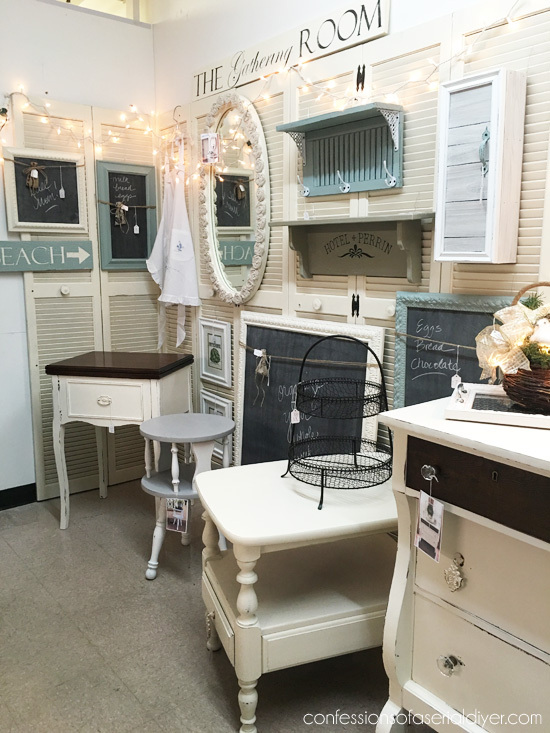 Love your booth–it looks so inviting! I just found this post today — thanks so much for some great advice. 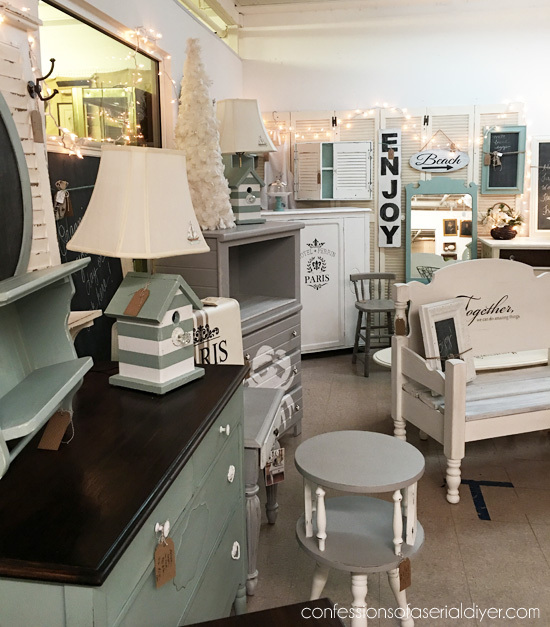 We have been considering this for a while, but all the good (and convenient) antique malls have a waiting list to get in around here. The rents are very high, too, and they require at least a six month lease. This is a bigger commitment than I want to make, especially as my style and the things I like to do are not what is still popular here, i.e white and grey. I was wondering about Etsy or another site on that order, but I do not know how to handle shipping, especially furniture. Have you any advice about that? Hi Ellen! I don’t ship, so I’m afraid I’m not much help there. In my area there are several Facebook Groups that are for selling furniture pieces, and things seem to sell well there. The customer would pick their items up, and you have no overhead. Maybe that is an option for you? Good luck! Thanks, Mary!! 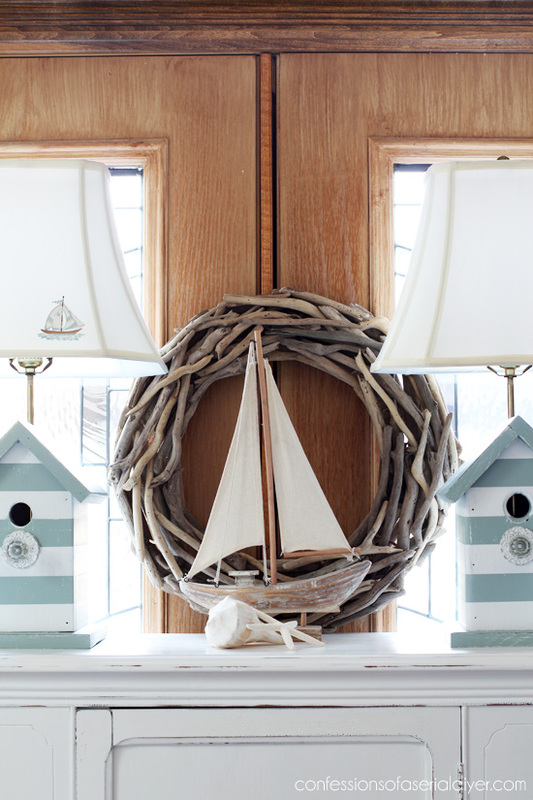 I love calm coastal colors, but white is my top seller. 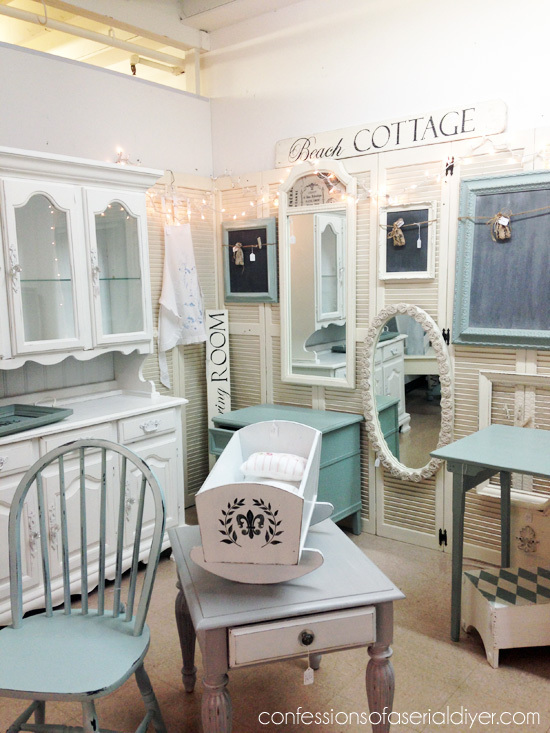 I would paint everything white if I could, but my blog would become very boring ha ha! Thanks for the info. I was thinking of renting a space and you gave some really good tips. I would love to try facebook also for added sales is there a site just for this or is it just hoping friends and family share? Im in the just starting and working on my inventory. where do you get your stencils? and what company do you get your paint from and colors or do you make your own?